Avoid creating a dull, boring or bland resume. You want to keep the content fresh, exciting and readable. Therefore, the use of bullet points are often useful, as they are short, to the point and focus the reader’s attention on what you can offer the company. When using bullet points, make certain that they are specific, focused, and achievement orientated. 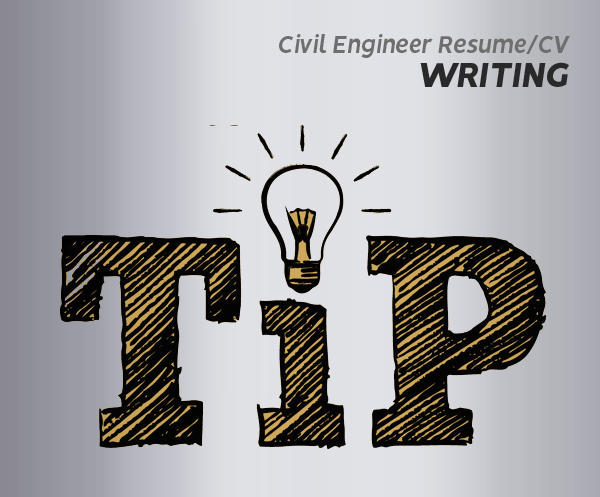 Below, we’ve included a few important, basic tips to help make your civil engineering resume stand out from the rest. 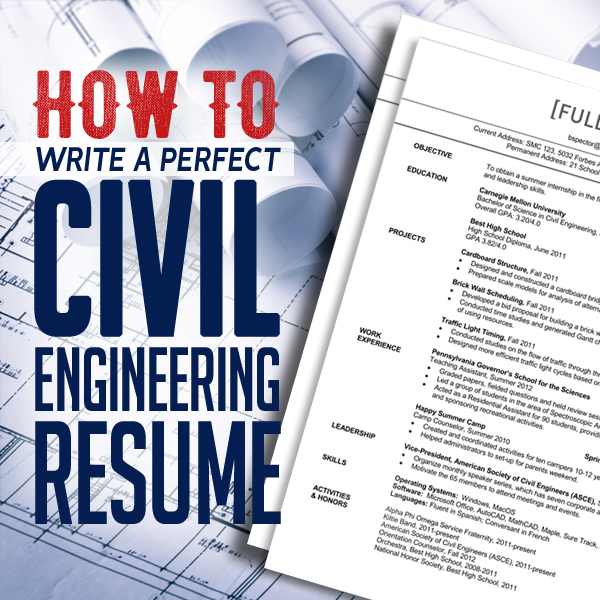 Make certain that your civil engineering resume is not cluttered. It must be easy to read, flow well from one section to the next, and use basic fonts. Fanciful fonts are very difficult to read, and your hiring manager has many resumes to go through each day, so will most likely send a resume with fancy fonts into the trash bin. A good rule of thumb is to use the Times New Roman font, with a font size of 12. After you have completed your resume, it is to your best advantage to use one of the many scanning services available online, which will scan your resume looking for important keywords and phrases. Remember when looking for keywords for your resume, to search for those within your specialty. For instance, keywords for individuals seeking employment dealing with electrical positions will have different keywords than those who are searching for positions involving environmental engineering tasks. Your objective is the first thing the hiring manager will read. Your objective is a way for you to formally introduce yourself to your hiring manager. A well written objective, also serves to encourage the hiring manager to continue reading your resume. When sitting down to write your objective, focus on your skill set, education and experience. Again, what you can offer the company. Remember to tailor the objective, as well as each resume, to the requirements of each job you are applying for. Have a positive attitude and take this opportunity to show why this company should hire you. The objective is usually used for entry level applicants with little or no experience. In formatting today’s resume, the professional summary is quickly replacing the objective. These summaries are designed to center on your professional qualifications, rather than your career objectives. The professional summary concerns how your professional and educational qualifications, along with experience combine to make you the best possible candidate for the position. Make certain that the summary is concise and makes good use of action verbs. The professional summary is the first choice for applicants with years of work experience under their belts. The fact of the matter is that your skill sets for this position are important and can even influence how much salary you’ll be offered. While your education in math and sciences is very important, it still does not reflect what you can actually do. You need to show the company that you not only ‘know’ but you can also ‘do’. in other words, you have to be able to show you are eager to take on any issues that arise and solve them in a prompt and cost-efficient manner. Remember to also include soft skill sets along with your hard skill sets. While hard skill sets involve such topics as software knowledge, your soft skill sets would include how well you work in a team setting with others. Civil Engineers solve and create. Knowing this, be sure to include any instance where you’ve led, or participated in a successful project. Note any and all pertinent leadership roles. State specifically how you solved problems. Again, it’s all about what you can do for them. How your addition to the team is a smart, profitable and cost-effective move on their behalf. Skill sets to highlight include: Communication, leadership ability, critical thinking, project management and technical skills. It is suggested that the format of the resume of an experienced civil engineer will be structured differently from an entry level civil engineer. The experienced civil engineer’s resume should center on work experience first, and education second. After all, this is what the company is looking for when they interview a seasoned civil engineer. What projects they’ve worked on, how they contributed to the project and challenges they’ve met and handled. The resume for the entry level civil engineer will be formatted differently. Since you’ll have little or no work experience, your resume will have to center on your qualifications, license, skill sets and education. Awards, internships, volunteer projects involving civil engineering experience, soft skill sets, and software are also important. List any seminars, adult education courses, or certificates you’ve earned which pertain to civil engineering. Below, notice how the entry level resume places educational achievements before work history. No matter what job you are applying for, all applicants should strive to have a resume which will pass the 10 second test. What is the 10 second test? This is the estimated time it takes recruiters and hiring managers to accept or reject your resume. To increase their chances of having their resume considered, it’s important for the resume to emphasize your professional job titles, education, contact information, and dates of employment. Your resume or CV is actually a persuasive document, where you are attempting to persuade a company to hire you. As a result, your resume should contain only information which are relevant to the position. Which means you’ll have to look at each job add separately, and craft your resume around each position. Edit out the fluff and fill your Civil Engineering resume with only pertinent details for each specific Civil Engineering job you are applying for. Avoid any unnecessary details. If you volunteered your time to a dachshund rescue organization, that is very noble, but may have no place in your Civil Engineering resume. Also, avoid boring the human resource manager to death with dull, repetitive language. This is your time to shine, so be certain to take advantage of the many resume sites which outline the best action verbs and remember to always focus on what you can do for the company, rather on yourself. It’s what you can ‘Do’ for them, not about your hobbies, your interests or your personal life. 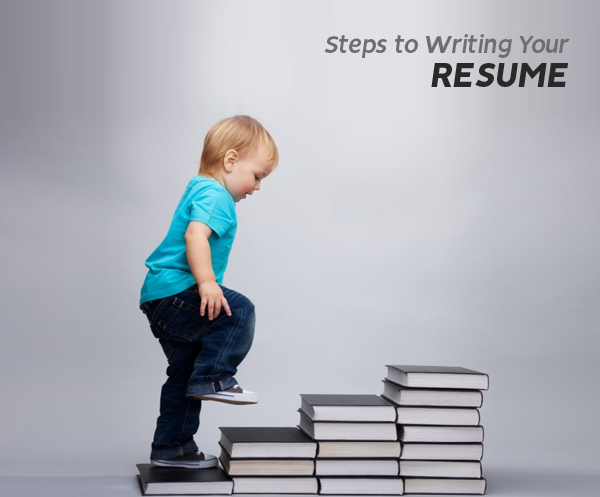 The first step is to select a resume format that best suits the job for which you are applying. These formats include the chronological format, functional, targeted or a combination involving chronological and functional styles. This depends on whether you are an entry level or have many years of work experience. Always remember the 10 second rule and realize that how well you write this section may determine whether the hiring manager or recruiter will continue to read your resume. Gather your work history, and arrange it in a reverse-chronological order, with the most recent first. Include your job title for each position and use bullet points to summarize your responsibilities/accomplishments for each position. Remember to use action verbs, facts and figures. This is also written in reverse-chronological order. Make certain to include your degrees, certificates, awards, as well as any seminars or lectures you attended. It is important that you center the skill sets around the job requirements you are applying for. Remember, that hiring managers and recruiters are only looking for candidates that can do the job. You can have 30 years experience making donuts, but those skill sets won’t help you get a job making ice cream. Feel free to add a section for hobbies, if those hobbies are work related. You may also add a section for any awards you’ve won, or achievements earned which are work related. Below we’ve included a short, simple civil engineer resume sample to help you. Dependable civil engineer with over 7 years of experience centered around project management. Resourceful with strong technical and organizational skills. Accomplished in governmental, commercial and residential projects. Organized, on time and energetic, with the ability to work independently or within a team scenario. As you can see, the position of ‘Civil Engineer’ encompasses a wide variety of professional positions, ranging from infrastructure to landscaping. Without civil engineers, there would be no civilized world as we know it. We depend on their technical skills and leadership every day of our lives. With such important responsibilities, it’s no wonder that their resume needs to be constructed in a way which quantifies their solid work experiences, gives specifics on both hard and soft skill sets, as well as licensing, affiliations and interpersonal aptitude. We hope our basic and brief guide on how to get started to write your own civil engineer resume helps you out just a bit by showing you the importance of key words, action verbs, and overall resume structure. We wish you much luck in finding the career of your dreams!